Anyone Elope & Then Have Ceremony/Reception Months Later? My fiance and I have decided that we want to work together to pay down our student debt. We have been trying to purchase a condo but currently we are not attractive buyers as we have to do FHA. Apparently traditional lenders don't take into consideration what you actually pay monthly for federal loans, they instead look at the highest amount you could possibly pay. We are now considering getting married much sooner than originally planned. We were thinking of August 2017 (we were engaged in December of 2014). We are very laid back and simple people. Our only wishes are to have as many family members present as possible and to also have a weekend wedding with a bon fire and breakfast the next day. We have found the perfect venue and plan on DIY-ing most things. Our current thought is what if we elope or just go to city hall and get the legal portion out of the way. Then we can have joint accounts and pay off debts collectively. In the mean time we are okay with renting and rent-to-own is a possibility where we currently live. Has anyone been able to keep a legal marriage a secret? Then throw a party 6-8 months later? Is this worth it? I'm wondering if it takes any of the "special" feelings out of the wedding day? I'm not a girly girl and never planned or imagined a wedding as a child/teen. I just want a day with family and friends around that celebrates our love and relationship. Re: Anyone Elope &amp; Then Have Ceremony/Reception Months Later? Hi, welcome to the boards there is no reason you can't have a joint bank account and pay off your debts together without getting married. FH and I have had a joint bank account for over 2 years and have paid off one of his credit cards and his motorcycle loan using both our funds. I don't think that's a good reason to have a secret legal marriage. Another reason not to do it is that it's wrong to lie to your guests. They will be traveling to see what they think is the start of your marriage, but you'll have been married nearly 2 years it sounds like. Yikes! I would be really upset if I found out. It sounds like you have a specific vision for your wedding day that sounds pretty awesome (I'm a bonfire bride as well)! I would stick with that rather than having a wedding at the courthouse followed by a pretend redo of your wedding later. Just curious as to how you managed your joint accounts? My fiance is in LOTS of debt (just student loans) and it is double what I'm in. I'm not comfortable with taking on the duty of paying down his loans (I make more money) collectively while I'm not legally protected should anything go awry. Perhaps the best solution is to just plan a wedding for less than a year from now. Which, oh boy - that would be interesting! I'm the youngest of 10 - so our guests would only be family (mostly) and a few close friends who are family at this point. I don't think anyone would really care if we were already legally married. It would be something that happens within 6 months of an actual celebration if we did it this way. Still just in the brainstorming phase though. I understand. Hell, my H (then BF) and I nearly broke up because we had joint finances and he went out and got a loan without me and I wasn't about to pay for his stupidity if there was no future. Anyway, for me, I'd plan a wedding for soon-ish so you can better yourselves financially sooner. I planned my wedding in about 13 days so it's definitely possible. Wow, 13 days! There is hope Thanks for your advice. It looks like an early spring 2016 might be best for what we dream of. He is a musician so it is not unlike him to go and buy an instrument or microphone or something ($$) and I just see that causing issues with joint accounts. If we are married and get cheaper health insurance etc. it will be more of a compromise that I can live with. So what we did after we moved in together was to write down our monthly expenses (including debt repayments) and our income, then put enough to cover those expenses and a little extra into a joint account every paycheck. The rest of our paycheck goes into our individual accounts and we buy gas, go out to eat, buy our own stuff, whatever, out of those accounts. The rent (now mortgage), utilities, credit cards, car loan, student loans, etc. all get paid out of that big pool of money in the joint account. FH has a higher salary than I do so to keep it fair we pay out proportionally - I think it's at FH 58% and me 42% to account for the differential in our salaries. In other words, if we deposit $1000 into the account per month, $580 comes from FH and $420 comes from me. Then our leftover is for us. FH still has more money leftover than I do, so it will never be perfect, but it's no biggie. If I'm cutting it close he'll cover something, or we'll use the joint account, and vice versa. We also have a joint savings and individual savings. We are each other's beneficiaries on investment and insurance accounts. We treat our finances as if we are already married and have since we moved in together. That's where individual accounts come into play - whatever he wants for his music, he pays for himself. If he doesn't have enough, he saves and waits. If he were to take the money out of your joint account for that without your permission, that's a HUGE trust issue. That makes sense...guess I should clarify. He would not be paying anything but minimums on his loans. I would be the one chucking extra cash towards them to get rid of them sooner rather than later. I would be sacrificing my own spending (not that I'm a spender anyway). I already pay the utilities on my own and we alternate who pays for groceries. I'm grateful that he has a full time job on top of his gigs - my thought is that we try to pay these things and get them gone before he tries to transition to a full time musician. His music just hit radio so we aren't sure what next year at this time will look like, but it could include a smaller scale tour. Looks like the only way to do this is to just get married with a prenup as soon as we can plan it and then worry about the rest later. Please don't lie to your guests. I'd be so pissed if I found out I was lied to. The day you sign your papers is the day you get married. Lots of people are in a situation where getting married would be financially beneficial and they make the choice of either waiting to get married until they can plan/afford it or having their wedding be at a courthouse (nothing wrong with the latter btw). Why do you need a joint account to pay off his loans? I have student loans my fiance doesn't. While we don't have a joint account yet we split finances so I'm paying off my loans in the same amount he pays for rent/utilities. So I mean while he's not technically paying for my loans (though he's offered before because he knows my medical bills are also high and he doesn't have any medical issues) I'm benefiting off him by essentially living for free. We split grocery bills so I buy one week, he buys the next. It's not perfect One week we may spend $75 the next week it's $110 but honestly we just act like it's a joint account. Finally a lot of people plan a wedding in less than a year. I had a little over a year but honestly after my initial vendors were booked I didn't do much for about 6 months. Now that it's in a month wedding stuff is in full swing again! I don't understand your reasoning for getting married secretly. You can do all of that (joint accounts, paying down debt, etc) without being married to each other. Just plan the wedding for when you're able to host everyone. Please, please, please do not lie ("keep a secret", lie by omission... whatever you want to call it) to your family and friends. Very likely, people will be spending a good deal of their own money to attend what they believe is one of the most significant days in your life...when really, they're just attending a fake do-over. Not only that but "getting the legal part out of the way" is pretty offensive to many people who have fought tooth and nail to have a right to that legal part, which you so nonchalantly refer to. Just wrong all around. Even if you take all the "wrong" out of it, it doesn't even make logistical sense. Do you keep future anniversary celebrations a secret? Do you lie about those, too? And you can have a joint account without being married. That's how H and I paid for our entire wedding. Here's how I'd handle your situation... If you really want to get married sooner than later, do it. Find a park with a pavilion (in case of bad weather and usually picnic tables are included - bonus!) and bathrooms (so you don't have to rent port-a-johns) and check into availability. If they have something available this fall, book it. Send invitation ASAP. To save money, have the event (ceremony AND reception) between the hours of 2-5pm or start it after 7pm. That way, you can just serve finger foods/cake/drinks and avoid serving a full meal. Since y'all are simple people, skip the flowers and fru fru decor, get your cake at Costco, and try not to get caught up in the "stuff". The bolded is exactly what FI and I decided to do as well. He came into the relationship with SL debt, car debt, credit card debt, etc. I did not. So I pay for all of the bills, let him know what his half would have been and he puts in that amount above the minimum as his payment. I am fortunate that I can swing this, and since him paying off his debt quick is important to me I don't mind doing so. He gets to finally feel like what paying off debts can feel like and gets motivated to keep going. If I ever put any money towards his debts I understand that isn't money I am going to get to see again, If I expected that I would write up a contract between the two of us with a repayment plan, but as it is I don't pay off his loans thinking I'll get to see actual cash back. I fully understand the concern about putting your money towards his loans when you don't have any legal protections. If you were to break up, you essentially would have thrown away all that money, with no legal recourse to get it back. We combined some finances well before getting married, but did not start paying off each other's debt or anything like that. We bought a house, and opened a joint checking account that we both contributed to, but we kept our own individual debts (credit cards, student loans) to pay off ourselves. Although, right before we got married we met with a financial advisor, and we came up with a joint plan that had us paying off my now-husband's student loans ASAP because they had a much higher interest rate than mine. Now that we're married I'm fine with that. As to your plan to get married and then have a "wedding", it's impossible. A wedding occurs the day you get married. Period. No exceptions. A reception, by definition, need to be tied to an event; a wedding reception is the party that follows a wedding. You cannot have a wedding reception without a wedding. If you want to elope then elope, and have a kickass party at sometime in the future if you want. You can ALWAYS have a party. No restrictions on that. But don't call it a wedding, because it's not one. People who have a fake wedding with a dress and "first dance" and all that at a time other than their wedding day is called a "pretty princess day" or PPD around here, and it is rude and tacky any way you look at it. We all can't have everything we want in life. That goes for your wedding as much as it goes for everything else. Thanks for your input. We are both products of divorce so we are coming at this from an analytical standpoint more than emotional. Not being a super girly girl I didn't understand the "correct" way to do things. I do know that I am not okay with paying all the bills unless we own a property (because essentially rent is not investing in our future - it is investing in someone else's equity). I hope people don't attack me for saying this, but I love him and he loves me, we've been together for six years, but I still don't want to put all my eggs into one basket. Love aside, we don't know what will happen to his music career, or our life over the next few years. Things can happen. We have talked at length and perhaps it is my fault for sounding wishy washy - I just assumed this forum would make up for my lack of close girlfriends. Oops. We both are on the same page as far as once you are married divorce is not really an option (except for infidelity); but we both also have the foresight to know that we don't know what the future holds. I still would like to prevent myself from paying into something that could go awry. I have loans of my own too, the only thing different is that mine are all federal and I can base them off of my income whereas his are private. So if we were to split I would have nothing to show for it and by that time my loans principal would be much higher because at this point I'm paying the minimum which hardly covers the high interest rate. But point taken: You can't get married and keep it a secret (that wasn't my intention - our parents and friends would know) - what I really meant was get married and have the focus be on an awesomely huge reception. That sounds like it is ok, but I can't wear a wedding dress or do anything to make it feel like a wedding. Marriage is no guarantee that things won't go awry. 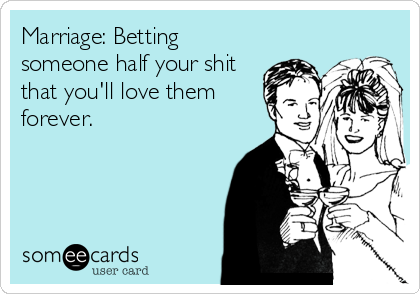 You could get married (publicly or lie about it) today, and start paying things jointly. He could still run off with the circus next year and leave you high and dry. You'd still have no way of recovering anything you paid toward his debt. Have the wedding you want, when you can afford it. But the wedding is where you actually get married. Pretending to get married after eloping is not ok.
All this is understandable. Just one thing: Call your party afterward "an awesomely large celebration" rather than a "reception." The word "reception" means that the guests have been invited to the actual wedding ceremony, which you say isn't what you want to do. The word "celebration" means that the actual wedding ceremony already took place. I think until you are married you should pay all you can to your own loans! Otherwise you are just giving someone money when you can't afford it because you are in debt. Then once you are married you'll be in a better position with your loans and can focus on his if that makes sense to both of you. Just because you can pay less on yours with income based repayment doesn't necessarily mean it's a good idea. QFT. Debt payments should come before anything that's not an absolute necessity. I don't really see where being married should make any difference in helping pay his loans, legally speaking. If you are married and get divorced, he's not going to be responsible to pay you back for all the money you contributed to his debts. Whether you pay it unmarried or married, there's nothing stating that he owes you that money back, unless you get something If you want to help contribute to paying down the debt now, but want some protection of repayment if the relationship doesn't work out, maybe write up a contract between you stating that you are "loaning" him the money. Then rip up the contracts after you get married, if you feel they are no longer necessary. Then if you break up, you have written contracts stating that he owes you that money back. DH and I lived together for 5 years before we got married. We had a joint account and each had individual accounts. We figure out how much our joint monthly bills were (rent, utilities, groceries & stuff like that) and each put that much into the joint account, so we contributed equally to the joint bills. Whatever was left went into our respective individual accounts for us to spend however we chose. I paid my student loans & car payment out of my account. At one point money got tight and we pretty much put everything joint and kept it that way. But, not everyone likes to have completely joint finances. This just isn't true in many states in the US. If you earn most of the money, and you pay off all his loans and none of yours, that's a factor the courts will consider in equitably dividing the assets. But we're not talking about dividing assets. They don't have any real assets. We're talking about repaying her for paying his debt, which would have to come in the form of alimony. I don't see her getting alimony if she makes more money, no matter what happens. Even if they could get the mortgage, the marriage is still not the guarantee that she thinks it is. 10 years from now, if they get divorced, and they own a house, and they each have retirement accounts, and she has paid off all his loans with money she earned, she absolutely might get more of the assets. It's obviously not a guarantee, but it's simply wrong to claim she is no more protected than she would be if they weren't married. She could be protected IF he actually makes the payments. We had to she dh ex bc she didn't pay of credit cards that were hers, but dh was a co signer. It ruined his credit. When you divorce you don't divorce your creditors. If the debt is in your name, you will still be reasonable regardless of what a divorce decree says. The debt only cares who is named on the loan. If you are concerned about him paying down his debt or you getting something out of paying it off, I would recommend the opposite. Wait to get married, have him refinance and sacrifice a little to pay it down before getting married. I helped dh pay off his debt, with the assumption that I would never get that money back. We had a contract prior to marriage when I was helping him, but once married it was no longer valid. I helped him bc I love him and it was best for our future.